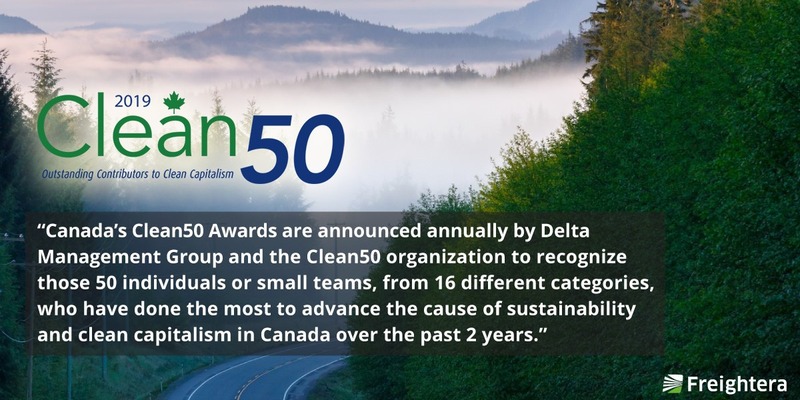 SupplyChainDigital.com picked up our recent press release about Freightera CEO Eric Beckwitt’s 2019 Clean50 Award and published a feature article about this news for the supply chain community. Thank you, Supply Chain Digital! This story will help us spread the word about our solution. The excerpts from the article below. “Freightera is preferentially bringing in new carriers that offer the highest quality service, the best price and lowest emissions for each lane and region, so shippers can continue to reduce emissions as they pay less and improve the bottom line in their operations. “Eric Beckwitt and Zhenya Beck, founders of the company, moved their family from California to Vancouver in 2003 and found that their son’s severe asthma relented in response to the significantly cleaner air, though the firm’s press release states that the couple’s dedication to sustainability pre-dates this revelation in their son’s health. Continue to read the article on supplychaindigital.com website. Photo: CN intermodal truck on the road in British Columbia.